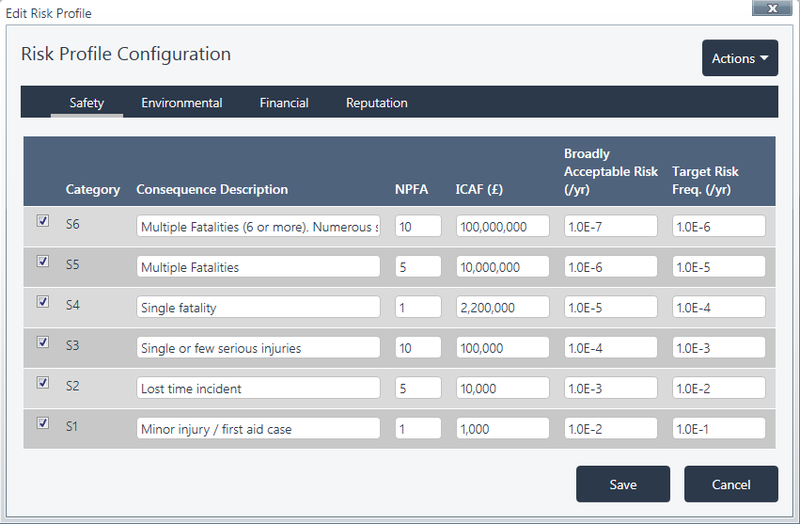 The Risk Profile is managed by clicking on Actions -> SIL Determination -> Risk Profile Configuration. 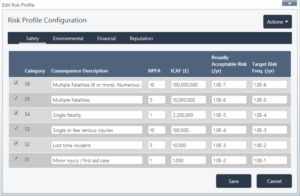 The Risk Profile is a matrix (or table) showing the relationship between Hazard Consequences and Risk Frequency targets. Target Risk Frequency (/yr) – The numerical severity of the hazard consequence as applied to employee safety, financial (asset protection), the environment and reputation. Note: When conducting an analysis for a Continuous SIF the units of the Target Risk Frequency will be converted into per hour. Only the rows which have their severity level box checked are “active”. A range of 1-6 severity levels can be chosen. Note: The consequence description is limited to 200 characters. The Consequence Category name for each configured category can also be changed. All projects start with default values which can be edited. Contact Us via the support page to configure the defaults to your company standards.